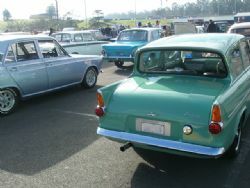 The Combined Ford Clubs of N.S.W. 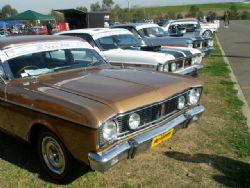 Inc. held their celebration of Fords finest at Sydney Dragway, Eastern Creek over the weekend. Festivities kicked off with a swap meet on Saturday and Ford only vehicles show n shine on Sunday featuring buses to drag cars and everything in between. 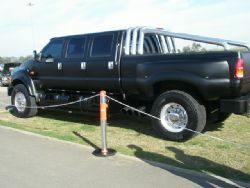 I couldn’t get there for Saturday so turned up early on Sunday morning to check out the vehicles at the show n shine. With blue skies overhead and a forecast for twenty-one degrees all was looking good until I encountered the car park, or should I say massive dirt bowl. There was a crater just as you entered that I am sure would have ripped numerous exhausts off cars and it would have provided the perfect opportunity to hide a video camera and watch everyone spit the dummy at having to encounter it. As I walked into the show there were a couple of vendor stalls selling coffee and food and a sparse array of original Model T Fords that immediately got me thinking there may not be many cars here today. Like most of my assumptions I was completely wrong. Laid out on a nice piece of elevated tar overlooking the race track the space kept going and going and it was very hard to tell how many cars were there – but it was a lot. A hell of a lot. 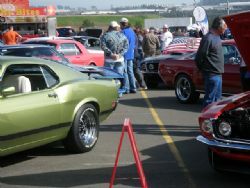 All the various Ford clubs were in attendance as well as a large number of Ford owners who entered their cars. Mustangs, Capris, Falcons, Thunderbirds, Cobras, Early Fords from the T through the forties, Mercurys, Anglias, Torinos, F series trucks – if it had a Ford badge you could see one at the show. I have never seen so many GT Falcons in one place in my life. Hundreds of them – HO’s, GT’s and clones from the iconic late 60’s to the XY and plenty of XA up models right through to current day offerings. All the blue oval fans were loving it. This show also offered something for the whole family. The kids section rivalled most school fetes and had a massive area covered with animal farm, horse rides, bungee, jumping castle, ride on tractors, petting zoo….. massive. There was also a large area of trade stands selling everything from FoMoCo merchandise to parts, tin signs, reference books, model cars to car care. Looked like they were doing good business too. After walking around six kilometres checking out the cars I was cactus and sat down and had a coffee and watched the world go by. Plenty of outstanding Fords, vendors, kids activities and spectators. The crowds were pouring in when I left at midday. Everything about this event is huge. For anyone that has an appreciation of Fords this event is a must see so be sure to come along next year for a day of blue oval entertainment.